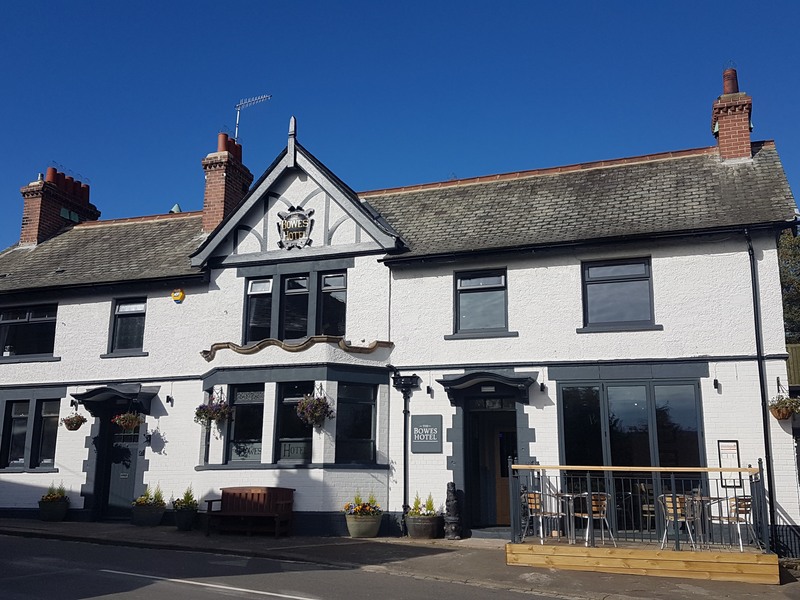 Completely renovated in 2018 The Bowes Hotel was originally built in 1906 but a pub has been on the site since the early 1800's . Fantastic views over the Tyne Valley and in the heart of the village. The room names are taken from the various names the pub has been called over the last 200 years, The Sportsman 1828 to 1834, The Hare & Hounds 1834 to 1855, The Greyhound 1855 to 1895, The Station Hotel 1895 to 1906, The Bowes hotel 1906 to present. Bardon Mill takes its name from the water Mill that was driven by adjacent Chainley burn, The Bowes Hotel has served several industries that grew in the village from the Woolen Mill in the 1800's, the coal mine (closed 1973 and now the site of the village hall) and Errington Reay pottery which still surrounds the pub and is well known throughout UK garden centers for its fantastic pots. The Station Hotel was razed and rebuilt in 1905 however at the time the Hon. Francis Bowes-Lyon noted 'that the original plans had not shown two extra bedrooms which had been added on the north side'. The architect offered his apologies and the four members of the committee decided to ignore this oversight for the sake of the benefit gained by creating more accommodation for visitors, the landlord and his family at this same time the Station changed its name to The Bowes Hotel, perhaps part of the oversight agreement! The Hon Francis Bowes-Lyon was residing at nearby Ridley Hall and part of the Queen mothers family, the Bowes 'Lions' stand proudly outside the main door. With investment in a new 'earth covered' Village hall, a thriving award winning village shop and tearoom and now the complete renovation of The Bowes Hotel Bardon Mill is a fantastic place to stay and explore Hadrians Wall country, Northumberland national park and its many walks and cycle routes. Due to its central location and easy access to rain, bus and road links Newcastle and Carlisle are easy days out as is the market town of Hexham just 11 miles away.